Picture framing Tools Scarce? No problem! You don't have any picture framing tools?? You don't even have any power tools?? ...your love for personal challenge wouldn't allow that. You've heard about or gone to a custom framing place only to wander out because your budget wouldn't allow that! So, you've decided you're going to figure this out and do it yourself, even without picture framing tools. There are still a few ways you can make nice frames without having to own or buy tools. Let's take a brief look at both options. Picture frame kits are nice because there are many options and styles to choose from. You can get them in wood, metal and even plastic. There are many companies on-line that sell them. Most major art stores also sell kits. 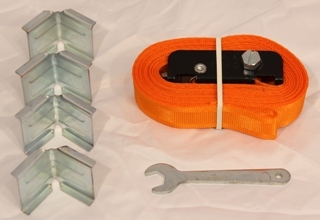 The nice thing about the kits is that they come prepackaged, in many cases, with everything you need. You get the rails to exact length, hardware to assemble them, the glass and backboard. Some companies even include matting. Kits are a nice alternative to having custom frames made for you because they're cheaper and are quick to assemble. You won't have to wait for days for the work to be done. Get the kit and within an hour, if you take your time, your picture will be on the wall. For the most part, picture frame kits come in standard sizes. Custom sizes are available though, but they generally cost more. This is another alternative worth talking about. While this may take a little bit more effort than picture frame kits (but hey,effort is no issue for you, right?) you can make nice frames while getting even more satisfaction from "making" the frame yourself. Picture frame molding is similar to picture frame kits in that the wood is already cut into rails and has decorative profiles. The back of the molding already has a rabbet cut into it to support the glass mat and backboard. If you're interested in some very nice, basic molding made of cherry, walnut, mahogany or oak at a very fair price, I'm your company - I mean I'm your man. I can cut the miters for you and send the pieces and lengths you need. If you want something custom, just contact me and we can work out the details. This is really how most custom framers and frame shops make their frames. They simply order molding, cut it to size and v-nail it together. There are pros and cons to this process which I'll cover on another page but for our purposes here, the thing to remember is that molding will save you the time of making your own rails and the need to purchase any tools. ...you will need a way to cut the molding to length. The cheapest way to do this, and without buying any power tools, is to use a miter box and handsaw. You can pick these up at the Home Depot or Lowe's or any hardware store for a grand total of UNDER $20. If you take your time and measure properly you can successfully cut matching lengths and create a nice frame. I recommend that you have the rails cut to length for you. 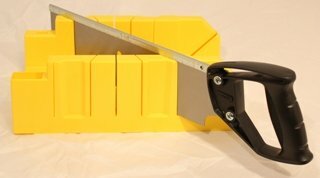 Mitre boxes are not as accurate if you are not VERY careful while cutting and measuring. I cover the actual steps to cutting molding and the assembly process here. Everything you find there will apply to making a frame out of picture frame molding.